In order to paint safely, whether by hand or using a paint sprayer, a sturdy ladder is essential! 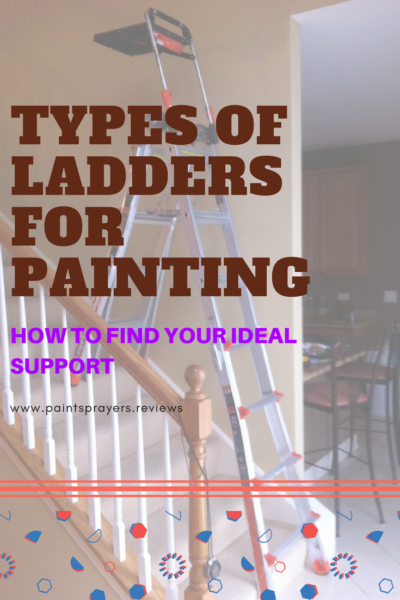 Your ladder should support you, your paint sprayer and your paint bucket. It should allow you to safely reach everywhere you need to spray, without stretching dangerously far or going beyond the last usable step. It’s important not to underestimate the importance of doing your research when you buy a ladder! If you skimp on this essential piece of equipment, you’re putting yourself at risk and making your tasks a lot harder than they need to be. Doing your due diligence doesn’t have to be difficult, though. Just read our guide! 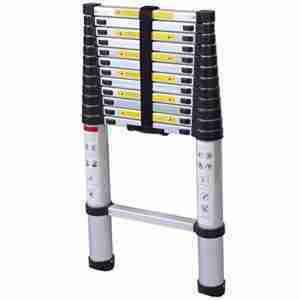 There are all sorts of ladders available to today’s DIYer or professional user. Here, we’ve rounded up a few of our favorites. Below, we’ll introduce you to the best models in each of the common categories. We’ll break down some of the key differences, and help you get a sense of which type of ladder will work best for your projects. If you’re just painting a few cabinets or doing other small projects, there’s no need to overthink it! DIYers who know they’re going to stick to fairly simple, accessible painting projects can easily get by using a simple stepladder like this one from Cosco. We like the Cosco over other inexpensive stepladders because it has an exceptionally sturdy frame and ANSI-certified specs. It can hold up to 225 pounds, and the slip-resistant treads offer sure footing on all the steps. This might be heavier than some other stepladders, but it’ll keep you safe and last for years. You get a decent amount of range, too. The Cosco’s top step is 30” from the floor, which is fairly standard for 3-step designs. You’ll be able to reach most cabinetry, as well as most door frames, depending on your own height. Importantly, it also has a platform built in! A lot of other simple stepladders only have the steps to work with, but it’s so much handier to be able to have a shelf at your work level. That way, you’re not constantly climbing up and down. You can keep paper towels, touch-up brushes, and things like that within easy reach. The shelf will also come in handy if you do any painting by hand! Another feature that earns high marks from us is the non-marring design on the feet. They’re wider than other stepladders. Combined with the rubberized material, that makes for a lot of flooring protection! Even on some ladders with rubberized feet, having less weight distribution can cause some indents on wood flooring. That’s not an issue with this thing. It’s as user-friendly as you could want. Of course, no stepladder is terribly complicated, compared to a larger support, but this one makes life easy. It locks and folds with a one-handed motion. The mechanism works smoothly, and it really is doable with one hand. There are obviously some limitations to working with a simple stepladder like the Cosco. You can’t adjust the height, and you can’t get more than a 30” boost. It’s good for small projects around the house, but you wouldn’t want to try and do a big job (like painting walls in a room) with something this small. Telescoping ladders are the latest and greatest thing in the world of ladders. They still can’t compete with traditional designs for the highest reaches or weight capacities, but they can’t be beaten in the convenience department! 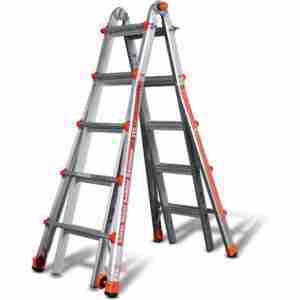 The Xtend & Climb 785P is our favorite telescoping ladder on the market at the moment. It’s actually the most popular on Amazon, but that’s not why we recommend it. We chose it above the competition because it has the best build quality, usability, and safety ratings. It’s extremely portable. 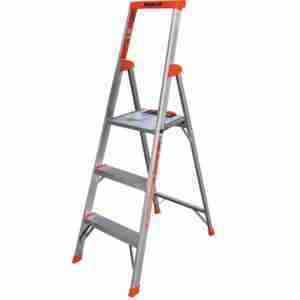 The big advantage of a telescoping ladder is that you can carry it practically anywhere. Traditional ladders fold up, but they’re always long and awkward. Not the Xtend & Climb! When collapsed, it’s a convenient yard-sized bundle. There’s also a convenient built-in carrying strap and closure system. You can use it to secure the compressed ladder, and then carry it under your arm. Everything’s very neat and self-contained. How many other ladders can you say that about? It has a very respectable range. This one has a maximum reach of 15.5 feet. The average person can reach to about 19.5 feet from the top usable rung. That’s enough for most projects around the house. It extends and locks by the foot, so you can get exactly the height and angle you need. That’s a key advantage of using one of these as compared to a traditional ladder. You can adjust those to a point, but not to the extent that you can a telescoping ladder! Everything’s well-designed and well-executed. The Xtend & Climb’s locking buttons are designed so that your fingers don’t get pinched, and it works neatly. Their indicators change from red to green to let you know when things are safely locked and ready to go. Non-slip feet keep your floors safe throughout use. This is the real deal. While there are countless knock-off versions of this ladder online, the Xtend & Climb is one of the only options that’s actually rated by official safety agencies. It’s ANSI and OSHA-rated for a 250-pound weight capacity! It’s sturdily-made, with an aluminum alloy tubing and a finish that cleans very easily. Knock-off’s abound, so be sure to buy from an authorized reseller (Amazon is one, just use the links in our reviews, since they go directly to a listing that’s both shipped and sold by Amazon!). Otherwise, you could end up with something rickety and unsafe. Telescoping ladders have come a long way since they first hit the market, and some of the latest models earn excellent safety ratings. Still, something like this will never feel (or be) as stable as a traditional ladder. There ends up being a fair amount of flex when you use them at full extension. One disadvantage of this format is that you can’t set yourself up at a distance from the wall. With a traditional folding ladder, you can simply unfold it a few feet from the wall, then paint. With this one, you’ll either have to move it along as you spray a wall, or set it against an adjoining wall. Still, for most purposes, it’s very usable. The other disadvantage of any telescoping ladder is the lack of a work platform. That’s less of a bummer when you’re spraying paint as opposed to painting by hand from a can, but still something to think about. This Flip-N-Lite is our recommendation in the “traditional” category. By that we mean ladders which conform to the usual triangular, folding format. It’s a typical design, but it has some tweaks that make it much more pleasant to use than your average hardware store offering. It has a very impressive weight rating. This thing can handle up to 300 pounds, and it’s ANSI/OSHA-approved to do so. You’d be hard-pressed to find “traditional” stepladders that can handle that kind of weight. It offers you a 6-foot boost, enough to safely tackle most projects within one story of a building. 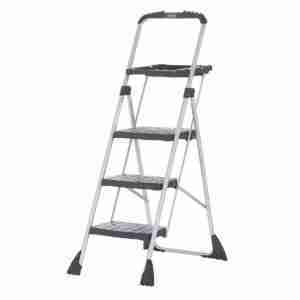 Unless you’re going to be working on stairways or projects taller than one story, this is as much ladder as you need. Since it’s a traditional design, as opposed to a telescoping ladder like the one above, you can have as much distance from your work surface as you like. There’s a big work platform, which you can also use for a wider standing perch. We love this thing: it’s spacious and sturdy. You get a platform as wide as the other steps, a full foot deep. So, you can use it for storing supplies while you stand on the next step down, or have a platform big enough to safely stand and spray! The steps are a bit wider than other stepladders like this, too. That makes it a lot comfortable to stand on them while spraying! The top has a small tray for hardware, too. It’s at the very top of the ladder, above the platform. This isn’t an essential feature by any stretch, but one of many details which indicate the level of though that’s gone into the design! It’s nice and light, at only 14 pounds. Anybody can carry this around easily. It’ll work indoors and outdoors. The feet are non-marking, but they’re also rugged enough to deal with gravel, cement, or tarmac. Little Giant (who make this one) offer a 1-year warranty. It’s not going to help you out past a single story. If you’re planning anything more ambitious, keep reading! You can’t adjust it, unlike the Little Giant models below. It’s a bit pricey for the format, even though we think the build quality and user-friendliness justify the cost. Little Giant ladders have made a name for themselves through their clever, versatile designs. They’re absurdly adjustable, compared to the inflexible (traditional) stepladder. The Alta One is our favorite of their offerings. We think it makes an excellent companion for anyone who wants ultimate versatility. It might look like one of those “as seen on TV” gimmicks, but it’s a real tool! The Little Giant is made from aircraft-grade aluminum. It exceeds all OSHA and ANSI standards, and is rated to handle 250 pounds in any configuration. Speaking of configurations, this thing offers 33 options! You almost certainly won’t use all of them, but the fact remains that it’s insanely versatile. You can get a traditional A-frame, a full-length extension ladder, right-angle ladders for stairs, or even make scaffolding out of it. You can adjust it by the foot, which isn’t possible with other A-frames. That allows you to use it at safe angles on stairs and other multi-level surfaces. Overall, this is the best thing on the market for working in difficult spots that aren’t safe or convenient with traditional ladders. At 22’, this one offers all the range any DIYer or medium-scale professional operator needs. Unless you’re going way up exterior walls, we can’t see why you’d need anything larger. In its extension mode, you can go as high as most of us will ever need to. We love the included work platform, which is very spacious. You can also configure it to be at whatever position works best for your project! There are wheels to help you move it around. It’s quite expensive. This could definitely replace a lot of different ladders in one package, but it’ll cost as much as several Flip-N-Lite’s. It’s not as compact or lightweight as the options above. This is nearly 40 pounds, and is a bit bulky when you have it all folded together. It’s not exactly simple, even though none of the adjustments are necessarily complicated. It’s more that there’s just a lot going on with the Little Giant. Got your ladder situation sorted? Excellent! Glad we could help. Now, get yourself set up with a high-quality paint sprayer! Our homepage is the best place to find reviews and buying advice to help you find your ideal one. DIY Paint Spraying: Do These Tips for Project Success!